New York, NY � The AES@NAMM Pro Sound Symposium: Live & Studio is set to demystify the full spectrum of wireless audio technologies and techniques with the return of the Entertainment Wireless Academy and In-Ear Monitoring Academy. AES@NAMM events, organized in topical Academies, offer a variety of educational opportunities led by top industry professionals, providing career-building insights and training for attendees at all experience levels. 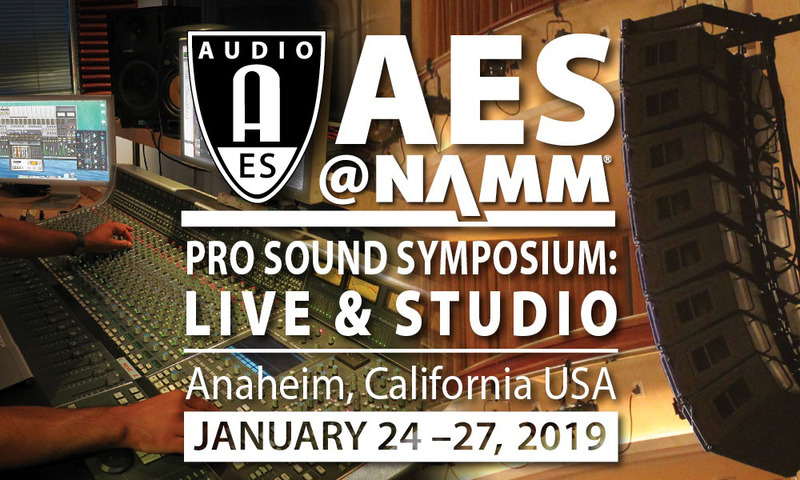 AES@NAMM takes place during The 2019 NAMM Show, January 24 � 27 in Anaheim, CA, in the NAMM U Education Center in the Anaheim Hilton, immediately adjacent to the pro-audio-centric exhibition in the new Anaheim Convention Center North Hall. With sessions all day on Thursday, January 24, and Saturday, January 26, hosted by wireless touring professional Ike Zimbel (Zimbel Audio Productions, Professional Wireless Systems/RAD), the AES@NAMM Entertainment Wireless Academy begins each day with a crucial Wireless Spectrum Update � a discussion of ongoing changes to wireless-frequency spectrum with Jackie Green (Audio-Technica/Alteros) and Karl Winkler (Lectrosonics). The days continue with classroom instruction on recent wireless hardware innovations from leading brands. Products covered by these training sessions include the Shure Axient system with Tim Vear and Adi Neves; Lectrosonics�s Venue 2, Duet IEM, and WD with Kelly Fair and Karl Winkler; Alteros�s 6.5GHz GTX with Jackie Green; and the PWS IAS and the RAD UV-1G with Zimbel, who will also cover �Professional Wireless Antenna Types and Designs� in a separate session. These educational presentations include best practices in antenna systems and frequency coordination in light of current and future wireless spectrum realities. The complete AES@NAMM Entertainment Wireless Academy schedule is available here. Taking place on Friday, January 25, the AES@NAMM In-Ear Monitoring Academy will be hosted by touring monitor mixer Mark Frink. The day begins with an IEM Fundamentals session with Frink and Dr. Michael Santucci (Sensaphonics) covering IEM best practices and examining the physiology of hearing and how in-ear monitors should be deployed to aid hearing conservation. This is followed by the session �Wireless IEMs and Spectrum Update� with Karl Winkler discussing analog vs. digital wireless monitor systems and the implications of changes in the available RF spectrum. The afternoon begins with �Choosing the Right IEM For Stage and Studio,� where Mike Dias (Ultimate Ears Pro) and Frink will educate attendees on IEM topologies including dynamic drivers vs. armature drivers, hybrid and multiple driver implementation, and custom fit vs. universal earpieces. The afternoon continues with the practical workshop �In-Ear Monitoring Advantages and Personal Monitor Mixing� with Mathias Von Hydekampf. The day concludes with the presentation �Workflows for Immersive Binaural IEM-Mixes Using KLANG:fabric� with Pasi Hara and Phil Kamp (KLANG). The complete In-Ear Monitor Academy schedule is available here.